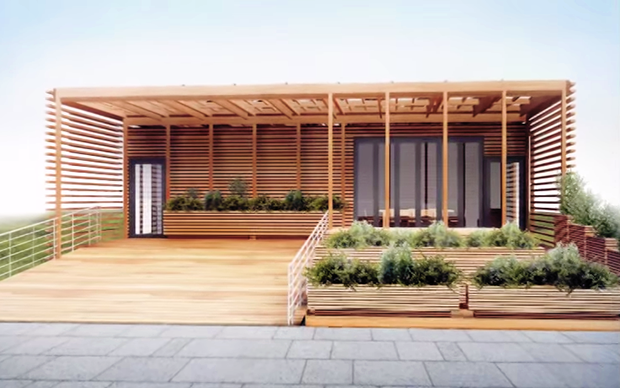 Although founded more than three centuries ago, since this is Yale University’s first Solar Decathlon the team, members had to scramble to make up for lost time. When they began their Solar Decathlon 2015 project nearly two years ago, the team consisted of eight inexperienced freshmen and sophomores. “None of us has built a house before,” says Kate McMillan, co-project manager. There were many moments when the crew seemed to hit dead ends — not enough time, money, experience, or backing — and yet somehow plowed through. “But that’s one of the purposes of the competition. You start out with students who don’t have experience, and by the end of a year and a half, it’s crazy how much you do know,” McMillan says. The team was fortified last semester by an infusion of grad students who were helping teach a class and then stayed on to advise. The expanded group of about 15 participants also decided to take advantage of the ambient breezes in the California climate, making the house site-specific. As a result, there’s nothing elite or Ivy League about the approach to what they call the Y-House. Instead, the compact 750-ft² shotgun-style structure is designed to reduce material costs and energy loads while giving the impression of spaciousness by integrating outdoor space. Natural ventilation will be maximized across the north-south axis of the house. Vents above the kitchen and bathroom areas allow for hot air to escape to lower mechanical cooling loads. The structure is geared for young professionals, who can enjoy a deck and trellised patio that effectively doubles the indoor space and forms a link to the outside, connecting to the community. Photovoltaic panels will be on the trellis, which can be used separately as a standalone feature in the future. Still, gearing the Y-House for California doesn’t mean the influences of New Haven and New England are lacking. “There’s a large tradition of outdoor patios if you walk around campus and town” that informs the house layout, Ponce De Leon says. The basic building concept is to employ modular construction by working with a housing manufacturer in Oregon. The team will add components, including a solar panel racking system and lumber from a Yale forestry site to complete the project. Furnishings will be simple to allow for ease of configuration. All the mechanical equipment will be in a module that will slot into the house. This “technopod” — which includes the bathroom, mechanical room, kitchen, and car-charging station — can be prefabricated and connected to the rest of the structure. And that’s where the fabled Old Blue network paid off. A Yale alumnus in the sustainable housing field is working with them on that aspect of the project. The team is proud of how far it has come — and how much impact it might have. In other Solar Decathlon news, the competition has expanded and will now include Solar Decathlon Middle East, to be held in Dubai, United Arab Emirates. The US Department of Energy and Dubai will produce two Solar Decathlon Middle East competitions: the first in 2018 and the second in 2020. A call for applicants for the 2018 competition will be issued this year.